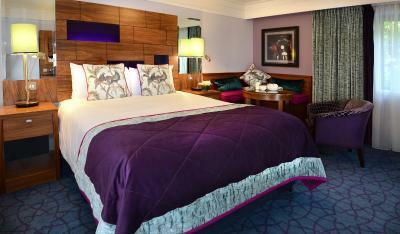 Lock in a great price for Clontarf Castle Hotel – rated 9.1 by recent guests! The castle was gorgeous! We loved the blend of historic and modern. Design was beautiful. Great piece of history. Wonderful service, food and beverage. Gorgeous hotel! I loved the castle, the history, the decor and the beautiful room. It really is a one-of-kind hotel... and worth every moment. The hotel was absolutely beautiful, the staff was very accommodating, and the price is just right. 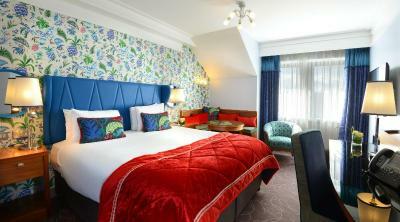 I would recommend this hotel to anyone who is planning a trip to Dublin! It was a beautiful hotel. Wish we had more time to stay and enjoy the facilities but we were flying out the next morning. Food was good, room was really great. Want to return!! The room was beautiful and spotless! The smart TV that had information of the area was very cool. Loved the bathroom, it was large and very nice! Also loved the travel cell phone provided. It helped with navigation around the area. Staff were more than helpful! The uniqueness of the "castle" portion of the facility. The grounds were beautiful! The food was wonderfully prepared and delicious. Good location outside the city. Very unique decor mixing the old with new. Staff very pleasant. Definitely recommend and would stay here again. Such a spectacular, beautiful hotel with much history! Loved staying in a castle! Enjoyed walking around and seeing all the beautiful areas. The room was clean, bed was soft/firm & slippers were provided as well. Clontarf Castle Hotel This rating is a reflection of how the property compares to the industry standard when it comes to price, facilities and services available. It's based on a self-evaluation by the property. Use this rating to help choose your stay! 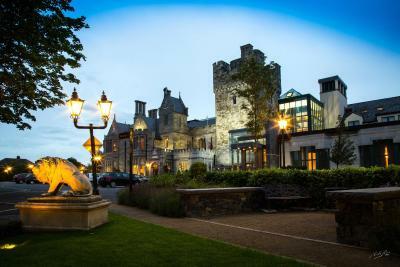 Set in an 11th-century castle the Clontarf Hotel combines ancient architecture with 21st-century facilities. 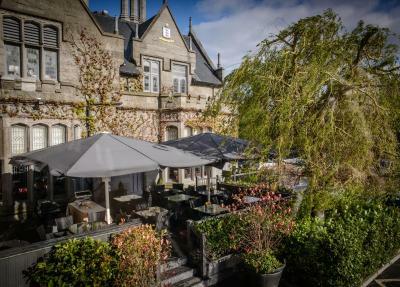 Just 10 minutes from central Dublin, this boutique hotel offers an award-winning restaurant and luxurious bedrooms. The Fahrenheit Grill serves fine cuisine and specializes in local beef and fish dishes. 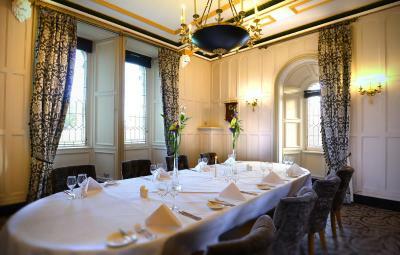 The Knights Bar has ornate ceilings, huge open fireplaces and stained glass windows. There is a bus stop outside of the Castle with regular services to the center of the city. Free parking is available at Clontarf Castle. 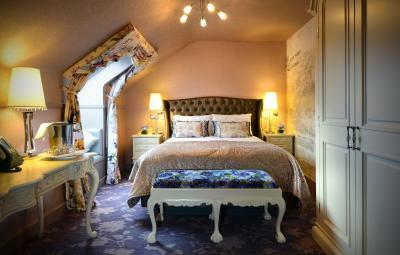 When would you like to stay at Clontarf Castle Hotel? Rooms have a 28-inch LCD TV, a laptop-size safe, US and European electrical outlets, a pillow-top mattress and custom photography. Please specify requested dinner time when booking (cannot be guaranteed). House Rules Clontarf Castle Hotel takes special requests – add in the next step! Clontarf Castle Hotel accepts these cards and reserves the right to temporarily hold an amount prior to arrival. The hotel will ask you to provide either a credit card or a cash deposit at check-in. If you require extras, such as flowers, fruit, champagne in your room on arrival, or a gourmet dinner in the restaurant, please inform the hotel. When booking 5 rooms or more, different policies and additional supplements may apply. You will be contacted directly by the hotel when the booking is made to arrange payment. A maximum of 2 adults and 1 child can be accommodated in all double/twin rooms. The maximum number of extra beds per room is 1. Only thing missing is a garden to sit out in, outdoor seating in the car park. Beautiful hotel, friendly staff (lovely lady in charge of the knights bar Friday night) comfy beds and lovely light rooms! The shower “door” did. It keep the water contained and the floor got very wet. I stood at reception desk for ten mins awaiting check in & was completely ignored by both the receptionist & asst manager (welsh guy). Given the price of this hotel I expected better - a simple greeting & “we’ll be with you as soon as we can” was too much to expect. I was only acknowledged by the manager after a kind waiter pushing a room service tray asked me if he could help me. As a local I was embarrassed that visitors could be treated like this when they visit Clontarf. Location picked as it was very close to relatives. The breakfast was good. The girl in the knights bar could not have been more helpful. I didn’t get her name but it was very busy and we were waiting to be seated for dinner and she kept coming over to us telling us it wouldn’t be long and could not have done anymore. The traffic you can get to go to Dublin /East Point Business Park - Nothing they can do much about it. I love the location and atmosphere of this place. The staff is friendly, the Guiness at the bar/restaurant is good and you can have one of your best run in Dublin thanks to its close location to St Ann Park.